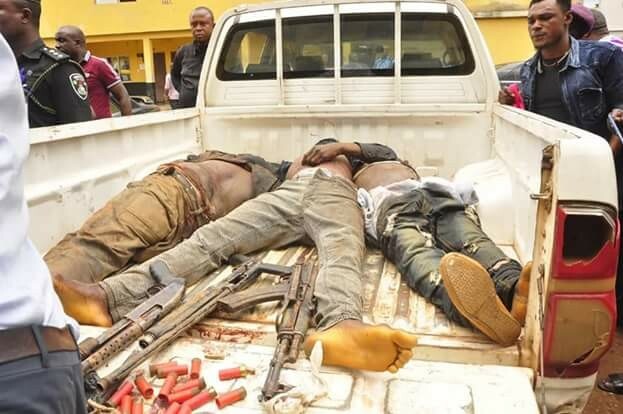 The Edo State Policr on Friday, paraded bodies of the three armed robbers killed in a gun duel with the police during foiled robbery attack on two banks in Igarra, headquarters of Akoko- Edo Local Government Area of the State. Twelve persons, including a policeman, were killed on Thursday evening, when the dare-devil armed robbers invaded a police station and two commercial banks, Unity Bank and Keystone Bank. Among those killed in the police station were two detainees who were said to have been arrested Thursday morning for minor offences, one of them was reportedly arrested for incomplete vehicle particulars. The armed men had first attacked the police station which is about 1.2 kilometers away from the banks, where they burnt the official vehicle of the newly posted Area Commander, apparently to demobilise the only means of neutralising their act and also killed a policeman. Three other persons were said to have also met their untimely death near the police station from the barrels of the guns of the dare-devil armed robbers. Four other persons were reportedly killed within the premises of the two banks. It was gathered that the armed men could not get access to the vaults of the banks. However, the police in the banks exchanged gunfire with the robbers, killing three while another unknown person was said to have been caught in the cross fire.